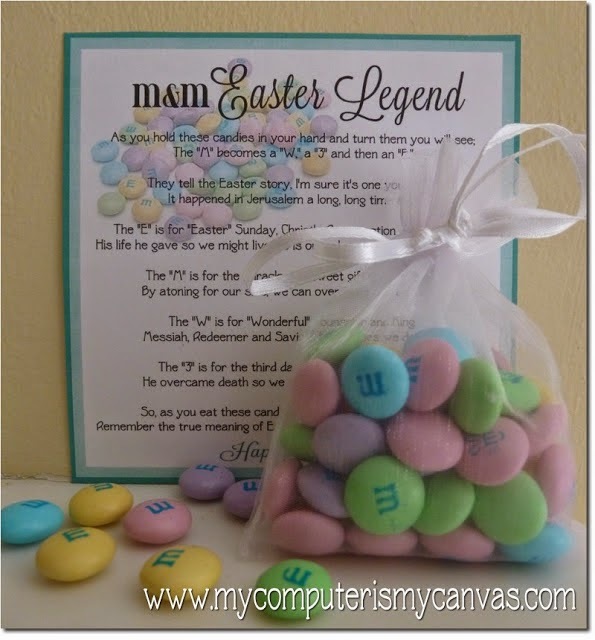 grandma's cookie jar: Resurrection Sunday M&M Project! Resurrection Sunday is just a few weeks away . . . so, if you are looking for a fun surprise which you can put together for your grandchildren, check this one I found on Pinterest! The "M" becomes a "W", a "3" and then an "E". It happened in Jerusalem, a long, long time ago. The "E" is for Easter Sunday, Christ's Resurrection we celebrate! His life He gave so we might live; He has a love for us which is so great! By paying for our sins Jesus gives us freedom from strife. Messiah, Redeemer and Savior; His praises we do sing! He overcame death so we might live eternally with Him! Remember the true meaning of Easter; a Heavenly gift of love so sweet! This poem is almost the same as the printable - I changed a few words to make them more understandable for children, so if you want to use this version, feel free to copy and add some clipart to make your own printable! Enjoy!